The bicycle doesn't ride itself! Look at all the other stuff you have laying around your house gathering dust. Most of the extra equipment is needed ONLY if you use the bicycle very regularly and at high intensity. Don't spend money unless you are certain the stuff you bought won't be collecting dust in a corner. Here is a summary of what you'll need in terms of equipment, sorted by priority. Please note that i'm assuming that the readers do not want or are able to spend a lot of money on equipment. UPDATE: Thanks to taonzen at reddit who pointed out a (now) very obvious thing. The priority list can change depending on where you live. My list is based on living in the inner city (very near the city center). If you live farther out, in the rural suburbs, a toolkit suddenly becomes much more important, since failure of the bike or a flat on almost any ride out will leave you stranded in the middle of nowhere. Bicycle - you aren't talking about cycling if you don't have a bicycle first. Whatever type of bicycle you choose, make sure the dimensions fit you. In terms of cost, the beginner cyclist should avoid the super-expensive bicycles. Choose an aluminium frame bike, and look at bicycles with a price limit up to $600 - $700. If you get serious about your cycling you'll be able to upgrade to a better bike later, and you can sell the old one easily since it falls in the affordable bikes category . Make sure you get a bell with your bike and avoid folding bikes, they tend to break at the joint welds (as did mine when I was a kid). Bicycle lock(s) - the harsh reality of the world is that bikes get stolen. A lot. And then some more. Invest in a good bicycle lock or more than one. I would suggest a U-Lock from hardened steel, or a hardened steel chain with hardened padlock. If you live and plan to ride in a low-risk area, you can go with a cable lock. I would suggest both a cable lock and a U/chain lock for rides where you plan to leave your bike for unsupervised for an extended period of time. Thread the cable lock through both wheels and the frame, and use the U/chain lock to secure the frame and back wheel to the locking post. Pump - get both a large hand or foot pump to keep at home and a small portable pump. The large pump pumps much faster and can bring the tires to a higher pressure. The small portable pump is slower, more difficult to use and does not support high pressure pumping, but is a life saver if you get a flat while cycling. ALWAYS carry the small portable pump attached to the bike, it has saved me from pushing my bike home on several occasions. Personally, I get away without a large pump, but there is a bike shop next to my house so I borrow their pump once a week. Fenders - Great for rain/wet conditions. If your bike doesn't have fenders as standard equipment, I would suggest detachable plastic fenders, so you can be more flexible. Some bicycles (usually road bikes) do not have sufficient clearance between the wheel and the frame or the wheel and the fork for a fender. Investigate fender options when choosing the bike. You can always decide that you won't be using the bike in wet conditions and ignore fenders altogether. Helmet - your safety on the bike is crucial. There is a lot of debate in the scientific community whether helmets actually help or not, but the currently accepted theory is that helmets increase safety. Even more so, a lot of local laws now mandate the use of a helmet while cycling. So even if you dispute the effectiveness of a helmet, use it, it will save you some traffic tickets. Eye-wear - You don't have a windshield when cycling, so insects, particles and rain can fly into your eyes. Choose eye-wear with several interchangeable plastic lenses (at least clear and dark pair) and frames which have rubber padding on the nose pad and the temples, so they don't slip as your skin starts sweating. Front/Rear Light - lights are another safety element, especially in low visibility conditions. If your bike didn't have lights as standard equipment, aim for low consumption lights (LEDs are good) which can be detached (no need to carry the front light in daytime). If you plan to ride in the dark, invest in a front light that will provide good visibility at night. Gloves - cycling gloves provide better grip, sweat collection and comfort on longer rides. They also keep the hands warm on cold days, since the hands are always exposed to incoming airflow. Choose a good fit gloves, they should fit snugly around the hand, so they don't slip or create uncomfortable creases when cycling. As you expand into winter cycling, invest in a second/third pair of winter cycling gloves. Specialized clothes - there is a whole bunch of clothes for cycling. The main function of cycling clothes is to remove sweat from the body and to provide comfort on longer rides. If you achieve regular longer rides (more than 20 kilometers), start thinking about specialized clothes, since cotton shirts will keep the sweat close to the body, and make the ride uncomfortable. Also, shorts padding feels weird at first, but I challenge you to use padded shorts for a month and then stop using them :) There are jerseys, cycling shorts, base layer shirts, leg warmers and winter jackets. Prices can vary wildly, eg. from $30 to over $500 for bib shorts. Start with a single set, and always look for clothes with silicone grips on the lower seams so they don't slip upwards when you lean into the handlebars. They should be tight fitting, to better collect and remove sweat from the body. Buy more sets as your cycling gets more frequent and you find that you need a second set while your first set is in the washing machine. Portable toolkit and spare tubes - The bike is full of moving parts, which can fail at the most inconvenient moment. If you plan to ride into the countryside, you should have some basic tools to keep your bike in rolling condition until you can reach help. There are many different toolkits available, so you need to choose one that has the tools to match you bikes' bolts. Always include tire removal tool, tube repair kit and extra inner tube and a chain breaking tool to fix a broken chain link. I also find it useful to carry some wet wipes so you can wipe off the grime of your hands. Oh, and if possible, make a dry run of using these tools on old bike parts at home, so you actually know how to use them. Apart from this priority list, there is a ton of extra equipment that you can add to your set, like clipless pedals and shoes, bags, speedometer and cadence meters, heart rate monitors, specialized self-sealing inner tubes etc. These can all be useful if you are a dedicated rider, but take your time before investing in them, they are far from essential. What is your priority list of cycling equipment? Tell us in the comments! Excellent post full of good advice. That's a well-composed list. I have been very fortunate for most of my commuting years to be able to park in a fully secure location. I've avoided the need to carry a heavy lock. Other than that I can agree on most of the rest of it. I prefer steel frames, despite the rust issue. Long-standing habit, I guess. Aluminum theoretically has a limited fatigue life, but any frame will crack if ridden long enough. For the tool kit I use separate tools rather than an all-in-one multi-tool. That way I don't have to disassemble and reassemble it like a puzzle. And some multi-tools don't easily allow for using two tools together. Check carefully when purchasing. Although I agree with your list of essential equipment, I would rearrange your order of priorities. I wouldn't dream of getting on a bike without a helmet, because I would be dead now had I not been wearing a helmet in an accident three years ago. You didn't mention anything about the colour of the clothing: I always wear bright yellow, and I can't understand why so many cyclists wear black or another dark colour. I do agree that it needs to be made from a modern synthetic material that doesn't stick to your body. Gloves: I prefer weightlifting gloves, which give a better grip on the handlebars than standard cycling gloves. Sunglasses: I wear high-tech Oakleys, because the optical quality is precisely what I need in bright tropical sunlight. Lots of great suggestions! I put a pretty high priority on shorts, especially for longer rides, but even for the shorter ones too. I think a lot of people are scared off by the spandex, and then miss out on how comfortable they can be. There are less 'dorky' alternatives out there. Also, I second Dennis on the use of non-cycling gloves, mine are multi-purpose outdoor gloves that have full fingers; they keep my hands cool in the summer and toasty in the winter. Excellent and simple explanation to beginners on the simple and easiest way to healthy living and commuting, the " CYCLE". 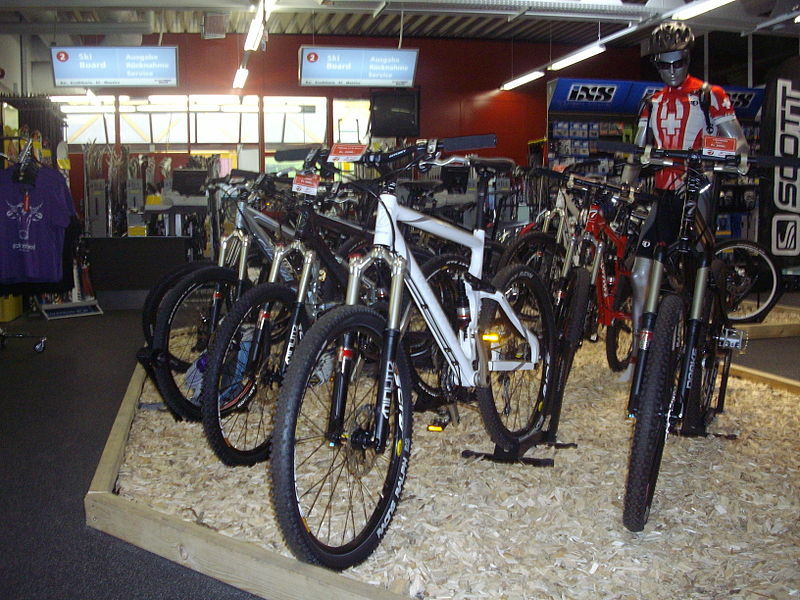 Glad that my "Wikepedia Commons " photo of a cycling shop c in Switzerland is a caption for this article. I have personally been a life-long cyclist since my youth and a model of the fact that daily cycling has kept me fit and agile.The future is unpredictable but i can guarantee the fact that cycling is the best, cheapest and simplest form of exercise for the human body although dangerous on the heavy traffic roads like Mumbai, my home city..
Beginning cycling can get lavish rapidly.There's a lot of advice on-line about purchasing bikes and you might as of now have a bicycle.Whichever way you ought to get along to your local cycling shop for some face-to-face obtaining advice or,importantly to get old bikes serviced. I love cycling.. this is very informative... thanks for all the tips. I will keep these things in mind. want to encourage one to continue your great job, have a nice weekend! Thanks for some other great article. The place else could anybody get that kind of information in such a perfect approach of writing?